Samsung chiefs have told AP that the company is determined to secure the number one spot in the mirror-less micro system camera market by 2012, and to be the best selling camera brand overall by 2015. Samsung chiefs have told AP that the company is determined to secure the number one spot in the mirror-less micro system camera market by 2012, and to be the best selling camera brand overall by 2015. Speaking to AP editor Damien Demolder at the company?s Seoul headquarters in Korea, Jeong Wook Kim, vice president of Samsung?s camera business, explained that a mixture of top quality products and innovative technologies will ensure a dramatic growth in the company?s market share over the next few years. ?We are passionate about making a success of the NX system,? JW Kim said, ?and we are certain that the APS-C sensor will dominate the compact system camera market. It won?t be long before compact system camera sales exceed those of DSLRs, and then Samsung will be the best selling camera brand?. Samsung is used to performing well in the compact camera arena, and is usually ranked within the top three brands, but Samsung was less successful in the DSLR market with its GX series of bodies created in partnership with Pentax. 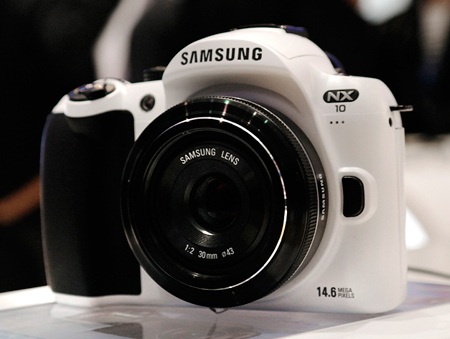 The new NX range of mirror-less cameras was the first micro system to sport the larger APS-C sensor, and Samsung plans to build on the image quality advantages of the sensor with new prestigious bodies and high performance wide aperture lenses, to accompany the DSLR style NX10 and compact design NX100. JW Kim told AP that the company?s focus for the near future will be to increase the pixel count of sensors used in the NX line, and to improve noise reduction processing, increase focusing speed and to develop higher quality motion picture recording. Citing the company?s slogan ?Innovation makes it easy? 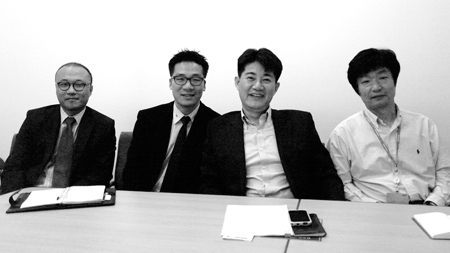 he also explained that Samsung is in a unique position within the photographic industry to converge technologies from other product groups, such as mobile phone, TV and audio, to create new product categories and new levels of functionality. ?We can move into areas where no one can follow?, he said. The company already markets a number of wireless imaging devices in still and motion picture areas, and with expertise in mobile phone, digital tablet and netbook/laptop technologies it hopes to expand the wireless capabilities of its offerings at home and in the field. With existing skills in touch-screen technology and high capacity processing experience in products such as the Galaxy Tab and S products, Samsung intends to make it easier for camera users to create finished images in-camera rather than having to resort to post capture PC software. 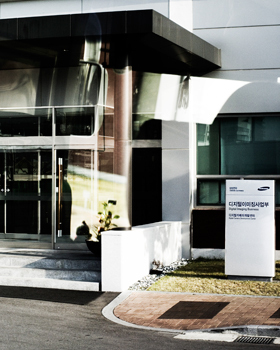 As the Samsung digital imaging division has been transferred from the Samsung Techwin company to Samsung Electronics the NX body and general lens manufacturing plant is set to move to new premises that will also allow the expansion of both product range and output. 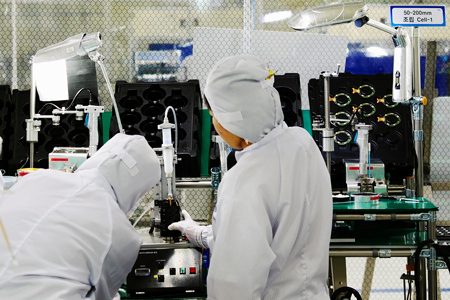 Glass moulded aspherical lens manufacture will be able to be stepped up, and larger lens elements are set to hit the production line. 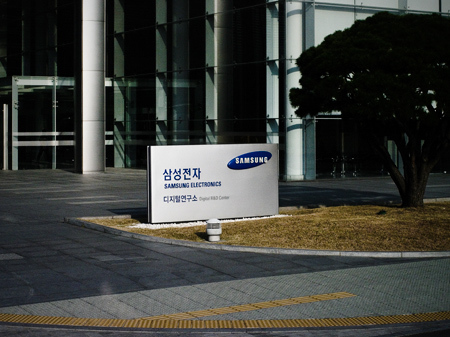 Currently the largest diameter element in production at Samsung?s factory at Busan, in the south of the country, is 30mm, but once the new plant opens it will be possible for the company to make elements of up to 50mm. This will in turn allow the production of high quality fast aperture telephoto focal lengths. The company is already experimenting with what it can do optically with the NX system, and has produced a range of prototype lenses for trials and investigation, including a 700mm lens engineers have used to photograph the moon. Samsung intends to develop 5 new lenses every year to build a significant range, and is already set to introduce a 18-200mm f/3.5-6.3 OIS, a 16mm f/2.8 pancake, a 60mm f/2.8 OIS macro and a 85mm f/1.4 lenses next year. The company also showed AP plans for a 16-80mm f/3.5-4.5 PZ OIS that will feature a power zoom function ? the first power assisted zoom interchangeable lens we?ve seen for some time. The display cabinet in the Samsung digital imaging HQ holds some surprising exhibits. My eye was drawn immediately to a rather worse-for-wear Minolta X-300 film SLR from 1983. Jeremy Shin explained why it was there, ?in the late seventies Samsung wanted to get into the camera business, but had no experience of camera production, so we sent a group of senior engineers to Japan to work for Minolta. Samsung paid them for four years while they helped Minolta develop new products and gained valuable knowledge and insight at the same time. 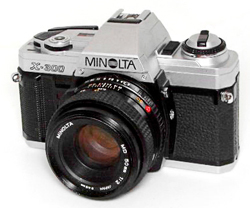 The first camera our engineers played a part in the development of was the Minolta Hi-Matic Strobo, which was released in 1979 and the Minolta X-300 came a few years later. The first Samsung-only camera was the SF-A compact camera from 1984, while the first mass production model was the Winky in 1986.? 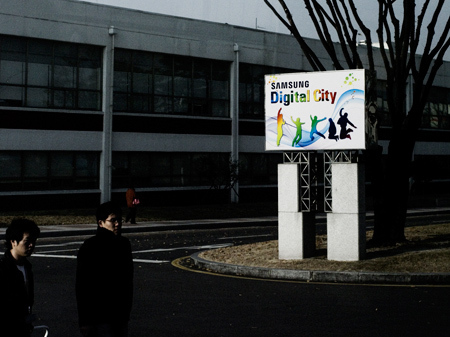 Samsung has been making digital cameras since the mid-nineties and was the first company to attempt to integrate other product technologies. 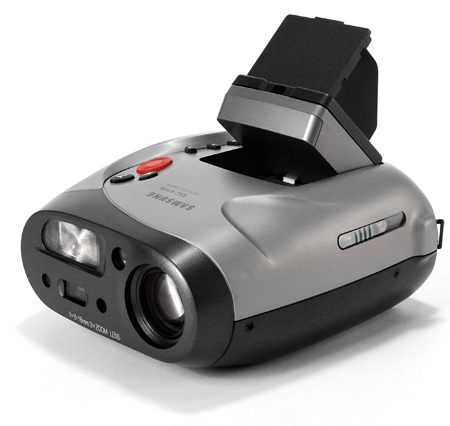 In 2000 the company launched the Digimax 35 – a camera with a built-in MP3 player, and in 2003 the SC-D5000 was the first video camera to shoot both stills and movie ? albeit via two separate lenses facing in opposite directions. In more modern times the HMX-S16 was the first movie camera to stream video wirelessly via a domestic network.